Art Asylum existed as a design studio for a few years before they started making their own toys - a lot of the really cool-looking figures that ToyBiz put out in the late '90s were their work, for instance. They became their own company in 2001, and took their toys in two directions: large, detailed figures, and small, blocky Minimates. One of the first toylines they produced was Crouching Tiger, Hidden Dragon, and I finally got the Minimates! Li Mu Bai was a Wudangquan swordsman who was looking to give up the warrior life. What's that mean? Well, Chinese martial arts are classified into two major groups: Shaolin and Wudang. Yeah, that shaolin. The term Wudangquan is also the root of "wu tang," as in Wu-Tang Clan. Thus we can say with some certainty that Wudangquan ain't nothin' ta F' wit. Wudang is also the umbrella under which tai chi can be found, which means those old ladies at the park early in the morning know the secret of the 36 chambers. Or at least that cash rules everything around them. Anyway, Li Mu Bai is wearing the traditional changshan (literally "long shirt") outfit, done here as a separate piece over the standard Minimate body beneath. The sculpt is simple, but they still bothered to sculpt the rope clasps that hold it closed. He has flared sleeves, a waist piece no one will ever see, and boots with sculpted ties around the shins - they fit over the feet, and prevent the ankles from turning. 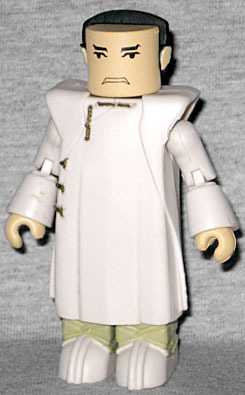 In 2002, Minimate likenesses were more about "simple" than "accurate," so unless someone told you, you'd never guess this was supposed to be Chow Yun-Fat. His hair is pulled back in queue, which was mandated for men during the Manchu Qing Dynasty - you either cut off the front of your hair, or they cut off your head. It reaches past his knees, and actually plugs into a hole near the back of the head, rather than in the center like modern 'mates. 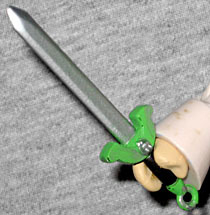 Mu Bai comes with one accessory, the Green Destiny sword. It's smaller than you might expect. At 2" long, it looks like it would be better suited for the smaller Minimates - remember, the original ones are 3" tall, not the 2" we're used to today - but at that point it would be nearly as tall as the character wielding it. As seen here, it's a little longer than his arm, which seems like a suitable size. Minimates also used to come with a puzzle piece display base thing, but I got this figure loose so mine doesn't have his. Eh, no big loss. It took a decade of patience for me to finally get the CTHD Minimates, but now that I have them, I'm not disappointed. It's something of a shock to see a Minimate that's so big, but you get used to that soon enough.